In 1900 Priamo Pellicci started to work for a little cafe in east London. When the owner of the cafe decided to leave, Mr. Pellicci bought it form him and with great help from his wife, Elide, the couple managed to run the business successfully whilst bringing up seven children. After Mr. Pellicci’s death in 1931, Mrs. Elide Pellicci continued to run the cafe and her initials were used for the name of the cafe, E. Pellicci, and is still emblazoned in chrome along with her portrait inside the cafe. Mr. Nevio Snr., who was born upstairs, ran the business after Mrs. Elide Pellicci until he passed away in 2008. Mr. Nevio’s wife, Maria, is the head of the family business today. She has been cooking since 1966 and has natural charisma that makes her a perfect successor to Elide. 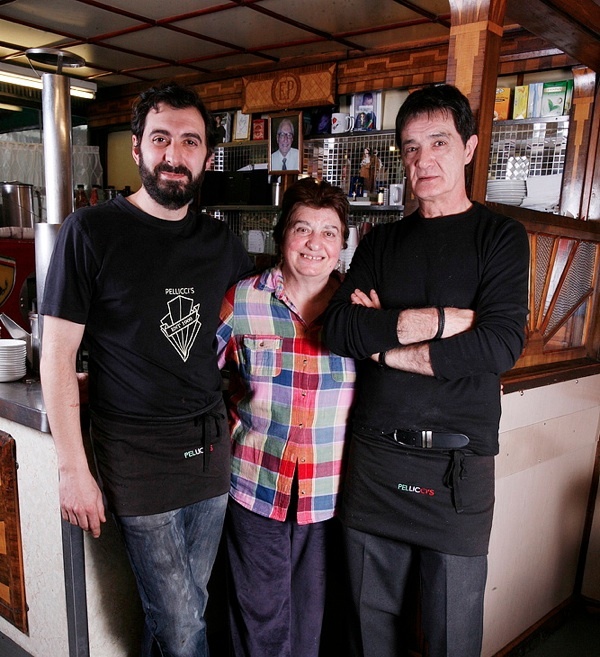 Maria’s son Nevio Jnr., daughter Anna and cousin Tony are the present team that run the E. Pellicci cafe business today. E. Pellicci cafe & restaurant has been awarded Grade II listed status by English Heritage.